climb Skyscraper Mountain (7,018); At the peak, we encountered a lot of bees and flying ants, and while not bothering us, nonetheless, it was a bit uncomfortable. We talked briefly with a lady who studied entomology and she said that insects (or she might have specifically said bees) go to peaks to mate. True? come down from Skyscraper peak and go to Granite Creek following the Mystic Lake Trail. return back to Frozen Lake and follow the Burroughs Mountain Trail to Burroughs Mountain 3 (the third hump of the Burroughs Mountain) at 7,820 feet. Burroughs Mountain is classified as an alpine tundra. It differs from an artic tundra in that snow melts and drains way in an and does not remain frozen or puddled on the surface. Winthrop Glacier, on the northeastern side of Mount Rainier, is named after writer, lawyer, and traveller, Theodore Winthrop (1828 – 1861). Burroughs Mountain on Mount Rainier's northeast slope honors naturalist and essayist John Burroughs (1837 - 1921). Emmons Glacier, on the northeaster side of Mount Rainer is named after geologist Samuel Franklin Emmons (1841 – 1911). And while we are at it, Mount Rainier’s current name honors the British naval officer Rear Admiral Peter Rainier (1741 – 1808). Finally, the standout plant on this hike is surely Polygonum newberryi, Fleeceflower, Newberry’s Knotweed. It is a member of the the Buckwheat family. At this time of the year, it’s a brilliant red with pieces of it blowing around a little like tumbleweeds. We were startled by it several times as it rattled by propelled by a gust of wind. This plant’s specific epithet honors John Newberry (1822 – 1892), surgeon and naturalist. On the walk on Burroughs Mountain we noticed the barren, rocky surface of the tundra. The pumice rocks reminded us of our previous hike through Spray Park and up towards Observation Rock, just west of Burroughs Mountain. After the hike, we started reading up on Mount Rainier’s post-glaciation volcanic past and realized that we were seeing the results of a past eruption of Mount Rainier. The story of the near-volcanic past of Mount Rainier is told in its tephra layers. 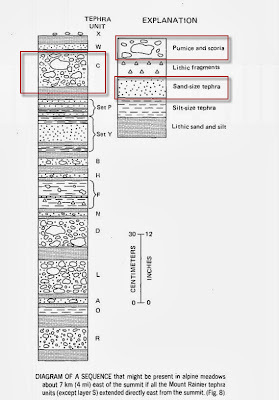 What is a tephra layer? – Tephra is a term that refers to fragments of rock and lava blasted into the air by volcanoes. Over time, tephra builds up into layer. 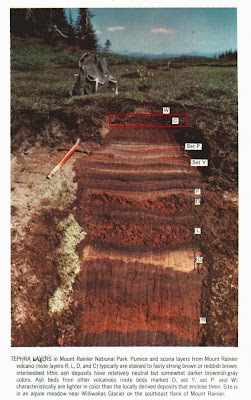 Tephra material is classified by size. Ash is the smallest with particles less than 2 mm in diameter. Lapilli is material between 2 and 64 mm. Volcanic bombs or blocks characterizes material greater than 64 mm. You often also see the words scoria and pumice used to refer to volcanic rock. Scoria is denser (has less pore space) than pumice. Both scoria and pumice are not found very far from an eruption site, while ash can be carried by the wind far away from an eruption. How many layers of tephra are there around Mount Rainier? – At least 22 in the last 10,000 years which is the approximate time since the last major glaciation. 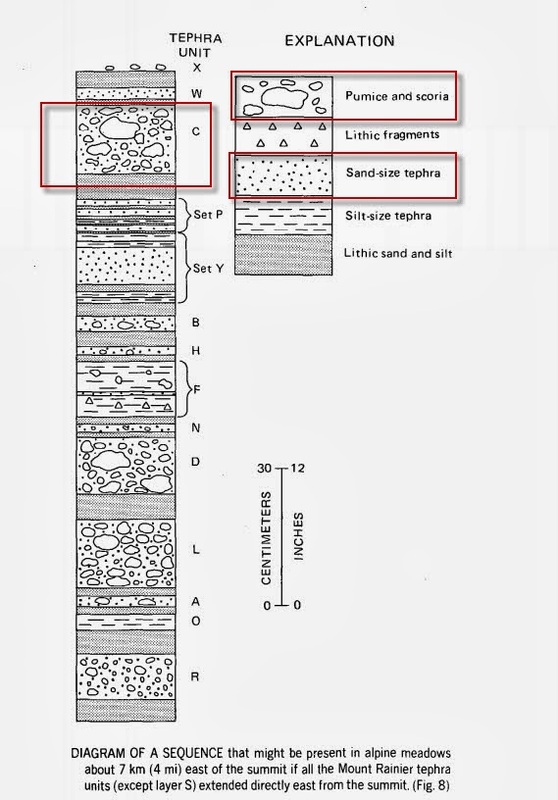 How are the tephra layers named? – Mount Rainier tephra layers are named using alphabet letters chosen after a physical characteristic of the layer. For example, layer Y is a yellow layer of pumice, layer O is an orange layer of material originating from Mount Mazama, and layer C is a coarse brown pumice layer. When was the last layer created? - Layer X was created about 190 years ago between 1820 and 1855. What’s an exotic tephra layer? – An exotic tephra layer is one that originates from somewhere other than Mount Rainier. Volcanic ash from Mount St. Helens and Mount Mazama (Crater lake) in Oregon can also be found in the tephra layers of Mount Rainier. 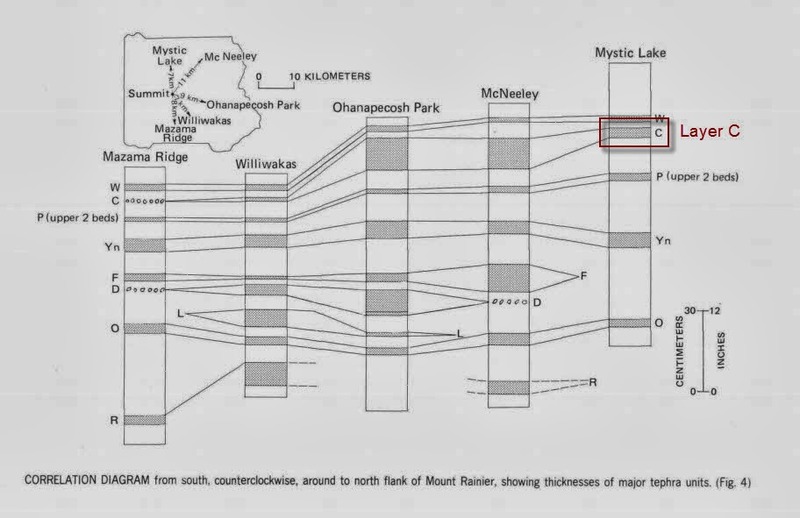 What’s this have to do with Burroughs Mountain? – Burroughs Mountain is a lava flow known as andesite. Burroughs Mountain is similar to several ridges radiating out from the base of Mount Rainier like Mazama Ridge and Rampart Ridge. These ridges resisted erosion from rivers and glaciers. On top of this old lava flow, post-glaciation eruptions from Mount Rainier left their mark in today’s tephra layers. The thickest and most widespread layer is a pumice tephra layer called layer C, which is found throughout the eastern and northeastern parts of the park like Burroughs Mountain. Layer C forms a thick brown veneer on the surface of parts of Burroughs Mountain. Layer C was created approximately 2,200 years ago. 2. 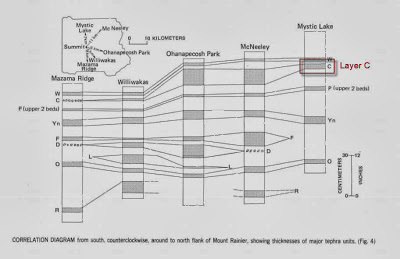 Other Pyroclastic Deposits in Mount Rainier National Park, Washington by Donald R. Mullineau, Geological Survey Bulletin 1326 . 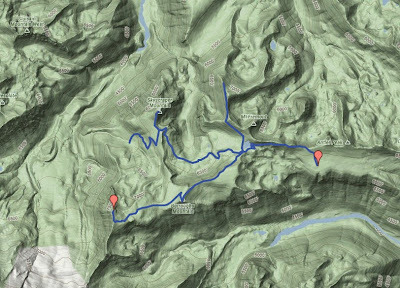 Elevation Gain: 5,280 feet cumulative, by GPS. Highest point 7,820 feet. Trailhead at 6,400 feet. Duration: About 10 hours. Started at 9:15 am from trailhead in Sunrise parking lot. Returned to car at 7:30pm. Lunch at the river (Granite Creek) at 1:30pm. Left: Dasiphora fruticosa near Frozen Lake; Center: Juniperus on Fremont Lookout Trail; Right: Eriogonum pyrofolium – Pyrola-Leaved Eriogonum or Dirty Socks! Left: View from Burroughs Mountain 3 (3rd Hump) to Winthrop Glacier; Right: Sign at the Point Where You Diverge from the Burroughs Mountain Trail to go to Burroughs Mountain 3. 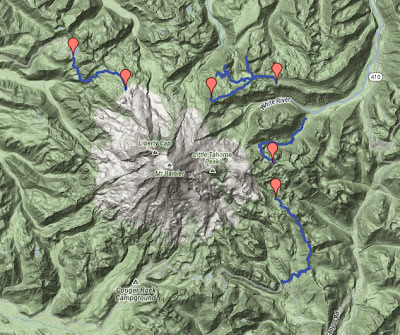 We started at Mowich Lake, following the advice on the Mount Rainier Spray Park Trail page and the WTA’s Spray Park page. We intended to hike up to Spray Park and turn around, but we ended up wandering toward Observation Rock. We never made up to Observation Rock (8,364 ft); we turned around at 7,200 ft at the edge of Flett Glacier. 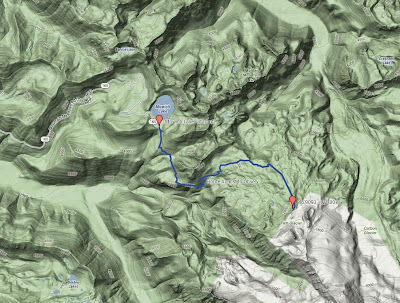 The Spray Park hike puts at 75 total hiking miles this summer over 7 substantial hikes (minus the jaunt to Hidden Lake). Our annus mirabilis for hiking. Ochotona princeps - American Pika. Spotted around the Mowich Lake parking area. Corydalis scouleri - Scouler's Fumewort Flowers. We are going to guess that this plant honors the Scottish naturalist, John Scouler (1904 – 1981) who visited the Northwest in 1825. Lycopodium clavatum - Running Clubmoss with it’s handsome sporophylls. Mycena strobilinoides – Scarlet Fairy Helmet found in needle beds and moss. Cladonia sp. – Cladonia, a moss-like lichen with “tube-like” structures. Gentiana calycosa - Mountain Bog Gentian in the Spray Park meadows. Tofielda glutinosa - Sticky False Asphodel with its reddish flower buds. Amanita muscaria - Fly Agaric, the quintessential toadstool. What is agaric? From Wikipedia “An agaric is a type of fungal fruiting body characterized by the presence of a pileus (cap) that is clearly differentiated from the stipe (stalk), with lamellae (gills) on the underside of the pileus.” The specific epithet comes from the Latin musca for fly and is based on a history of its use as an insecticide when sprinkled in milk. Saxifraga tolmiei – Tolmie’s Saxifrage. Honors William Frasser Tolmie (1812 – 1886). Also accessible from Mowich is the Tolmie Peak trail. Empetrum nigrum – Black Crowberry. Lupinus lepidus var. lobbii – Dwarf lupine. Lagopus leucura – White-tailed Ptarmigan. This ptarmigan was very calm; he didn’t seem to scare easily from his meal of crowberries. Melanoplus femurrubrum – nymph, we think. Duration: 10:07 left trailhead, arrived back at 5:35pm. About 7.5 hours. Elevation: Started at 4,000 (Mowich Lake), turn around at 7,200 (estimated), near, but well below Observation Rock (8,364 ft) at Turn around point from Garmin: N 46°, 54.559", W 121° 48.424" or 46.9093, -121.8071. Location: Mt. Rainier -- NW - Carbon River / Mowich, Mt. Rainier National park. Cicindela depressula – Dispirited Tiger Beetle in Spray Park. Thanks to reader cicindela who pointed this out.